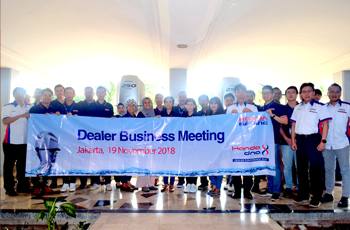 Jakarta, November 19, 2018- PT Honda Power Products Indonesia as Single Agent Brand of Honda Marine in Indonesia hosted 14 dealers during its 3th annual Honda marine dealer meeting in Jakarta. Focus on strengthening the dealer network and HPPI's commitment to the Indonesia Marine Market, Honda DNA is very essential in order to increase Market share in Indonesia. In addition, thank for dealers who have given their maximum effort to sale Honda Marine Products.